When we Alt/Option click the eye on a layer, we see this layer only. I wish PS had native functionality to do this inside a layer group only, keeping what was visible outside of it untouched. 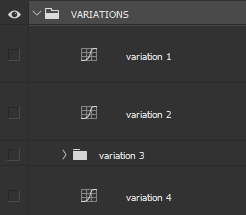 This way you can switch between, for example, variations you made inside a layer group (and not needing Layer Comps). Ctrl+Alt/Option + eye click for example. I don't think it has? The simplest alternative I'm envisioning is a hotkey to a script that cycles through the first level of layers inside a layer group and makes visible *only* the next layer each time. My first questions are if this has already been solved before? Or if anyone feels it so useful they might wanna whip it up? Make the layer visible again that we saved.